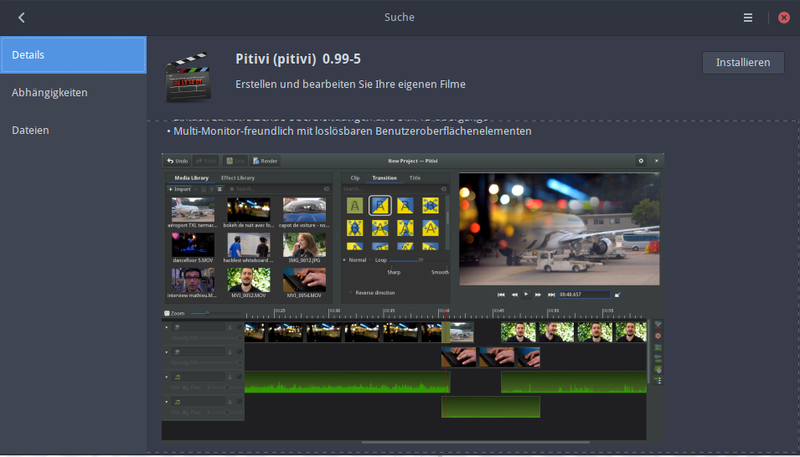 Ich nutze seit einer Weile Antergos Gnome (3.28.2), wirklich tolles System. zu der hier bestimmt jemand etwas sagen kann (Googlen bringt leider nichts). Hello and welcome to the Antergos forums! There can be issues when trying to install external packages, especially the latest beta versions. I think the best thing to do is to ask from the pitivi developers, since they have the best knowledge about the requirements of their software. Thou shall not use flatpak! Pitivi (pitivi) 0.99-5 is also in community Repository, and installable over package management. Thx for searching ;) - I’ve already the latest (official) version installed, I just wanted to have a look at the developer one, because the 0.99 is feature-locked (1.0 STABLE release candidate), and the master-branch seems to make some new features available, like slo-motion/accelerate and keyframes for transformation properties. @joekamprad We set the channel to allow only registered users, because of spam. Maybe that’s why it looks empty, because you did not actually joined. We’re working on improving this. @idoki Our instructions need updating. If you’re interested in fixing them, please assign https://gitlab.gnome.org/GNOME/pitivi/issues/2204 to you and click the Edit on GitLab link. @aleb greatfully thanks for your response here!